Pomp and piety, apparently contradictory spiritual forces, unite in the liturgical action of the procession. The participant is at one and the same time part of a public parade and a spiritual journey. The creation of a suitable exterior appearance can, moreover, serve to reinforce the desired spiritual order not to contradict it. In traditional Christian liturgical practices, processions offer a specific sense of beginning or movement to a service so that the mere process of lining up to begin a procession creates a sense of anticipation of the liturgical event that is about to happen. This sense of anticipation is true even within a modern church setting where the community gathers only once a week for worship. 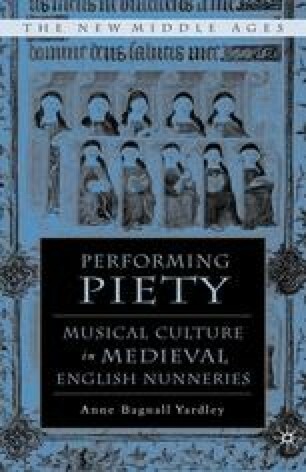 Within the medieval monastic framework there were twenty-four services each week most of which did not include a procession. Thus the procession on Sundays or principal feast days signified a notable departure in the regular worship routine.